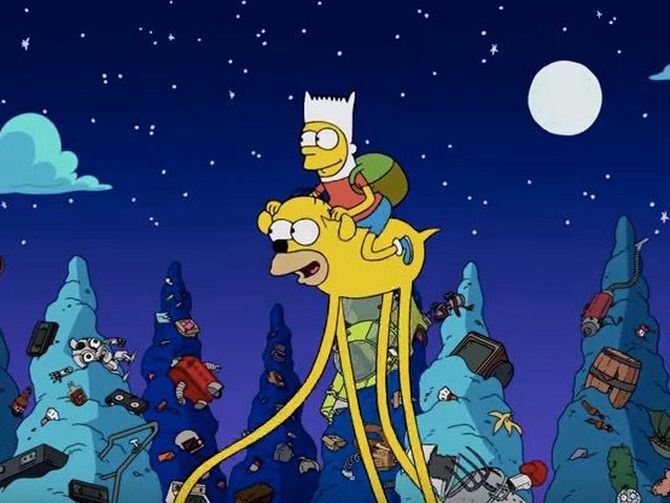 The Simpsons kicked of Season 28 in style last night with an Adventure Time inspired couch gag! While there is no word of any Simpsons/Adventure Time mashup episode, it was a lot of fun to see our favorite Springfield residents appropriately given Adventure Time personas. Adventure Time creator Pendleton Ward also makes a brief cameo in the couch gag as he sings about Bart the Human and a Dog named Homer. We loved seeing Mr. Burns as the Ice King, Maggie as Princess Bubblegum riding Santa's Little Helper as Lady Rainicorn, and Smithers as Tree Trunks, but we want to know what your favorite mashup character was during the couch gag.